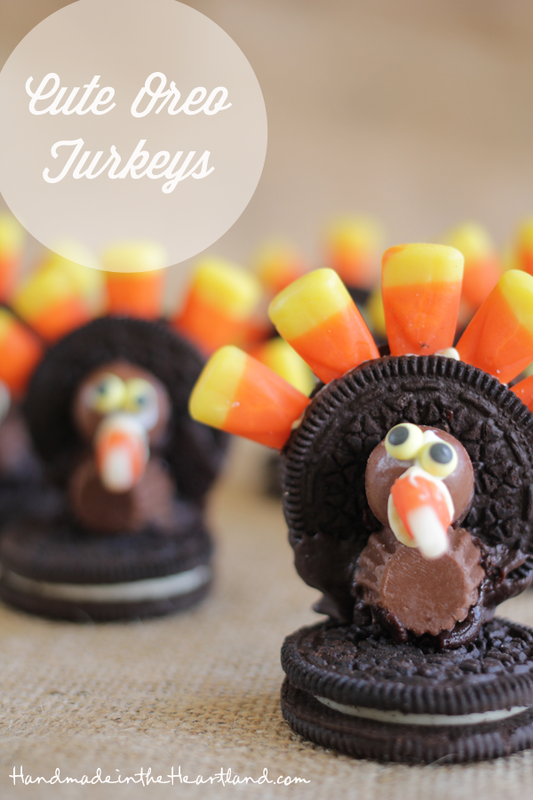 Ok i know i’m going a little crazy with the candy-cookie creations, but c’mon these turkeys are so cute! Need an activity for the kids Thanksgiving morning? This one will be perfect, as long as your kids are older than mine. Do you have any thanksgiving traditions with your family? Most of my Thanksgivings were spent with my dads side of the family and we ate on a ping-pong table because it was the only table big enough to fit us all, then after the big meal we took off the tablecloths and had a ping-pong tournament, it was always lots of fun. 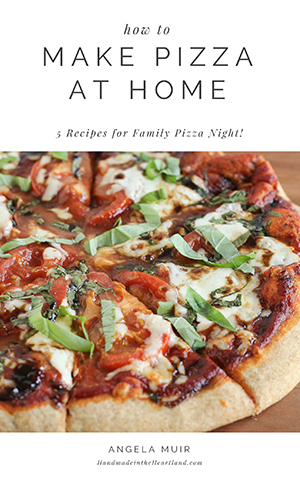 I’ve been trying to think of new traditions that i can make with my kids for the holidays and would love any suggestions that have worked well for you. Keep reading for the instructions on making these little turkeys. First push candy corns into the filling of the oreo’s for the tail feathers. 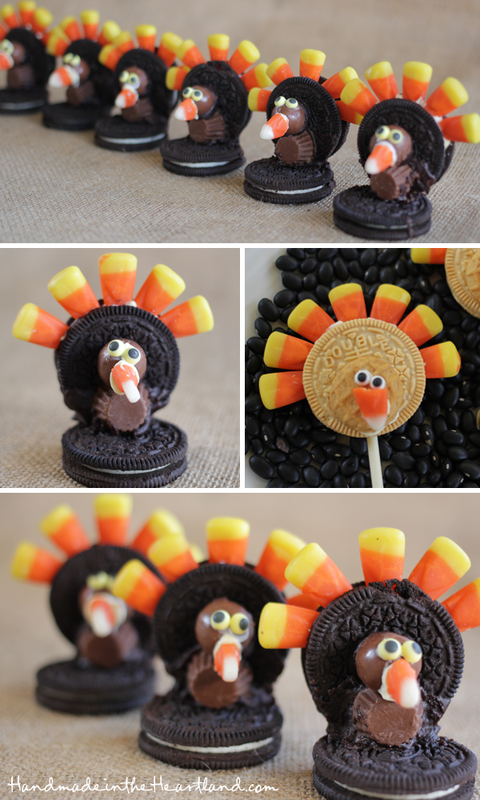 If you are doing the 2 oreo turkey like above, glue the oreos together using icing or melted chocolate, if you are just doing them on sticks go strait to adding your head elements. 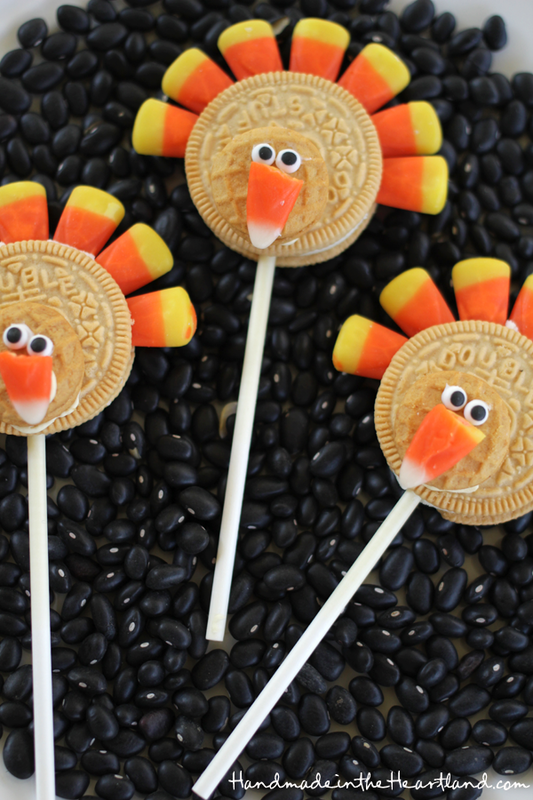 After glueing the oreos together then add the mini reese’s as the body, the whopper as the head and the candy corn nose and candy eyeballs. I think they would make perfect place card holders at each place setting on your table, don’t you?